Cirrus clouds generated from the contrails of jets may be the cause of more atmospheric warming today than all the CO2 emitted by the aviation industry since the beginning of flight. Aviation is responsible for about 5% of man-made climate change effects, and that proportion could triple by 2050 according to some projections. Least understood is the role of aircraft exhausts in forming clouds. If conditions are right, then hot and moist air from the jet engine exhaust meets cold air in the upper atmosphere, and forms fine, but short-lived cirrus clouds which trap the planet's heat. 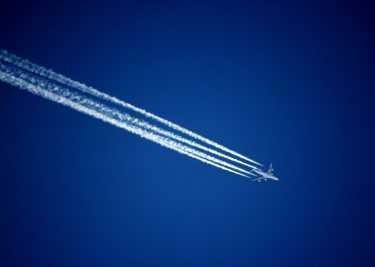 Perhaps a third of the climate effects of aircraft, or 1.5% of all anthropogenic climate change could be due to contrail effects. Smarter jet engines could be a solution. The work is important because if the team's model of how these clouds form are correct, then contrail generated cloud effects must be included when looking for ways of mitigating the impact of our continuing love of flying. 'There may be some easy options to reduce contrail formation, for example changes in flight altitudes, or rerouting aircraft away from areas where the contrails will form, but either of these could have the negative effect of generating additional emissions so more research is required,' added Burkhardt. Future improvements in jet engines or the development of alternative fuels might also help diminish aviation's effect on climate.